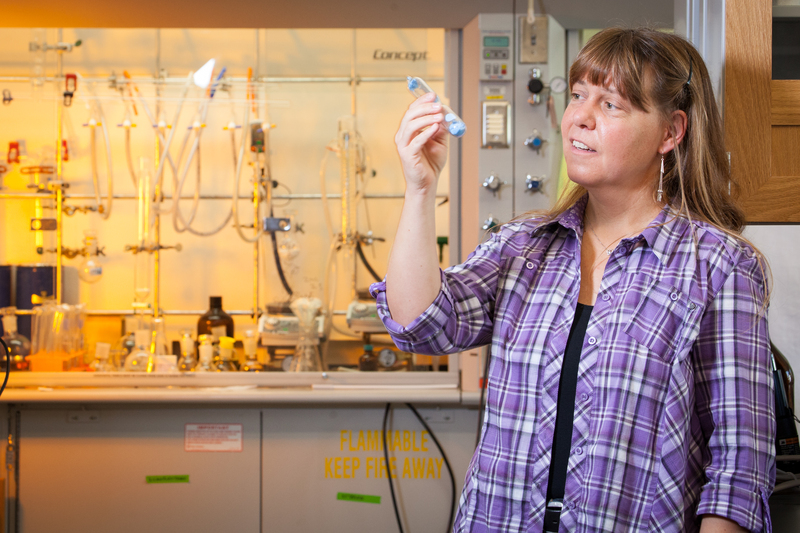 Susanne Striegler, a professor of chemistry and biochemistry, was awarded an Arkansas Biosciences Institute research grant for fiscal 2016. FAYETTEVILLE, Ark. – The Arkansas Biosciences Institute has awarded University of Arkansas researchers grants for 39 science and technology research projects for fiscal year 2016. The institute is a partnership of scientists at five research institutions across Arkansas, including the state’s flagship university in Fayetteville, with a focus on supporting biomedical research and agricultural research with medical implications. The fiscal 2016 grants at the U of A totaled $1.58 million, said Roger Koeppe II, Distinguished Professor of chemistry and biochemistry, who represents the flagship on the institute’s scientific coordinating committee. Institute-supported investigators explore many different body and cellular processes in their search for answers to challenging basic science- and health-related questions. Koeppe said the institute chooses projects that are both innovative and may need preliminary results in order to compete for research funding on a national level, from agencies such as the National Institutes of Health or the National Science Foundation. The committee also considers funding for shared equipment, and bridge funding. Multiple researchers may request funding for major instrumentation that they will share, Koeppe said. This year, Michael Lehmann, an associate professor of biological sciences, was awarded an Arkansas Biosciences grant for $56,257 to study a potential drug target in the fight against obesity. His project is using fruit fly genetics to shed light on how lipin, a protein involved in fat and energy metabolism, is normally regulated and what the consequences are when the protein loses activity. Since coming to the university in 2002, Lehmann has received more than $1.38 million in funding from the National Institutes of Health, the National Science Foundation and the Arkansas Biosciences Institute. Susanne Striegler, a professor of chemistry and biochemistry, was awarded an Arkansas Biosciences Institute grant for $50,913 to evaluate the inhibiting effect of chemical compounds she synthesized in her lab on certain enzymes, to develop new tools for the diagnosis of Alzheimer's disease and the early detection of cancer. Striegler has received nearly $700,000 in funding from the National Science Foundation and Arkansas Biosciences Institute since coming to the university in 2012. The vision for the Arkansas Biosciences Institute emerged during a statewide planning process for use of the state’s share of the 1998 nationwide tobacco settlement. Health care leaders across the state spoke out in favor of dedicating a portion of the tobacco settlement funds to innovative research that could improve health and help reduce or prevent smoking-related illnesses. Arkansas voters endorsed the proposed Tobacco Settlement Proceeds Act of 2000, and the Arkansas Legislature enacted the provisions of that proposal as Acts 1569 through 1580 of 2001. Part of that legislation established the Arkansas Biosciences Institute as a consortium of five research institutions: the University of Arkansas at Fayetteville, the University of Arkansas System’s statewide Division of Agriculture, the University of Arkansas for Medical Sciences, Arkansas State University and Arkansas Children’s Hospital.